The terminus is located in Piazza del Carmine. Journeys are held from Tuesday to Sunday at 11 a.m., at 12 p.m., at 4 p.m. and at 5 p.m.
With Trenino Cagliaritano you can explore the most important and striking places of Cagliari. 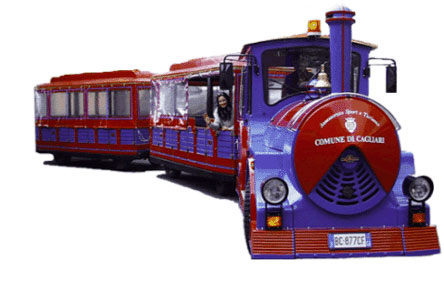 With Trenino Cagliaritano you can easily visit the most important places of the town from the historical, cultural and landscape point of view. The small size allows to walk down the narrow streets of the medieval district of Castello, the central areas of commercial interest and the alleys of the ancient Cagliari. From the characteristic red and blue color (the colors of the city), this little train is equipped with a locomotive and several carriages that can accommodate up to fifty passengers. During the journey, a guide on board will show, in different languages, the various stages of the itinerary which lasts about 45 minutes. The terminus is in Piazza del Carmine, the ticket costs eight euros and can be purchased on board; children up to three years old travel free and discounts are available for groups.